Reared for culinary success, Mexican-native Ambrosio Gonzalez recently opened his second restaurant La Catedral Café and Restaurant in a quiet, residential neighborhood in Little Village. “The second time around I feel much more at eased,” laughed Gonzalez. His first attempt at owning a restaurant was short lived as Gonzalez had to tend to a family matter. “It was something that had to be done. The irony is that we had to close just as it started to become very busy for us,” said Gonzalez. Still, Gonzalez never lost hope at making a living out of his number one passion. 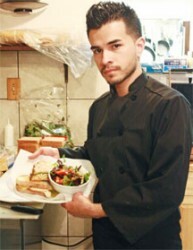 As a teenager, Gonzalez learned the inner workings of running a restaurant by watching his parents in action at their family styled restaurant for several years. “It wasn’t glamorous. My parents would wake up really early in the morning and not come home till late at night. But helping them out kept me off of the streets,” said Gonzalez. When he immigrated to Chicago at the age of 17, Gonzalez brought with him the work ethic his parents instilled in him, determination, vision, and not to mention several family recipes. “I have to say, we have the best enchiladas in the City,” laughed Gonzalez.